Do you have a great idea for an Online Contest? Well that could be my next one! Contests are a great way to advertise a site and direct traffic to your theme related page. Your business could attract a lot of attention by sponsoring a contest. 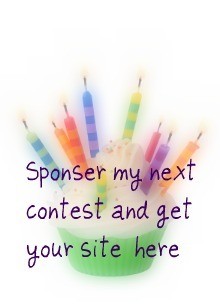 You should be prepared to provide a prize to an approximate value of $50, either cash, voucher or birthday related, in exchange for advertising on my site for the duration of the contest. You can either think of a theme for the contest your self, related to your site or I can provide a contest subject for you. If you are interested in sponsoring my next contest simply contact me and we can discuss details.